Over the past week, the anarchist affiliation Antifa (“Anti-fascist”) has received widespread and favorable coverage in the establishment media. On August 18, the New York Times, the main newspaper voice for the Democratic Party, published a major front-page feature article, “Antifa Grows as Left-Wing Faction Set to, Literally, Fight the Far Right.” The piece, written by Thomas Fuller, Alan Feuer, and Serge F. Kovaleski, showcased the views of the movement with interviews of its members. The article presents Antifa as a serious force for fighting fascism, all but inviting readers to sign up. The Times article is not the only example. On August 20, NBC’s “Meet the Press” carried a segment featuring Mark Bray, author of Antifa: The Anti-Fascist Handbook and Lecturer at Dartmouth. The prominent and sympathetic coverage for Antifa from the Times, the Post and NBC is politically sinister. The Times has a policy of excluding any genuinely left-wing opinion, while “Meet the Press,” the most widely-watched Sunday news program, never interviews or features in its panel discussions anyone outside what is considered acceptable by the political establishment. At the same time as it is giving favorable coverage to Antifa, the Times, Post and other media outlets have collaborated with Google in the effort to suppress genuine left-wing opposition, including the World Socialist Web Site and other sites. The promotion of Antifa serves several interrelated functions. First, the physical violence of a handful of protesters in any large demonstration is regularly used as a pretext for police provocation. This is true not only in the US, but in Europe and around the world. Police give the “anti-fascist” and anarchist groups a free hand to carry out provocations, which are then exploited to carry out a violent crackdown. The groups themselves are easily infiltrated by police provocateurs, who encourage violent acts for the desired end. 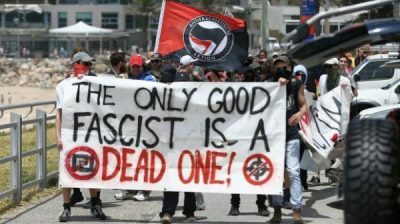 The politics of the various groups that comprise Antifa are, moreover, entirely compatible with those of the Democratic Party, and serve a purpose for that section of the political establishment. Since before Trump was elected, the Democratic Party has sought to channel widespread popular opposition to Trump behind the military and intelligence apparatus. Indeed, the conflicts within the ruling class since the Nazi rampage in Charlottesville have culminated in the strengthening of the grip of the military and financial elite over the Trump administration. The first product of this restructuring was Trump’s announcement of a major escalation of the war in Afghanistan. The Democrats and affiliated media, particularly the Times, have sought to bury the basic class issues—the fight against social inequality, war, and authoritarianism—through the promotion of a series of diversionary issues. The Times has relentlessly promoted the anti-Russia campaign, seeking to channel mass opposition to Trump behind the demand for more aggressive measures against the government of Vladimir Putin. It has encouraged the conception that the United States is divided by immense racial divisions, promoting both the identity politics of the Democratic Party and providing respectful and even admiring coverage of what it calls “white nationalists.” It has also prominently featured the Jacobin magazine, affiliated with the Democratic Socialists of America, which supports the Democratic Party. The promotion of Antifa conforms to this agenda. Indeed, many of the groups involved in Antifa are essentially factions of the Democratic Party. By Any Means Necessary, BAMN, which is mentioned by name with a link to its website in the Times article, is among the most fervent advocates of the racialist politics of the Democrats. It received national attention in 2014 for its campaign for Affirmative Action, which was waged in alliance with the Democrats and sections of the corporate elite and military. Adherents of Antifa claim they are fighting the fascist threat by physically preventing neo-Nazis from getting a hearing, denying them access to schools and cities where they may reach followers. Ignored, however, is the role of the Democrats and the social and political conditions that create fascism. The neo-Nazi groups are themselves at present a minuscule social force, unable to organize more than a few hundred people for their major rallies, including the demonstration in Charlottesville. Trump and his fascistic advisers (including the now-departed Stephen Bannon), however, are seeking to exploit political confusion and alienation to develop an extra-parliamentary far-right nationalist movement. To the extent that a fascist movement will develop, it is because they receive the backing of a section of the ruling elite under conditions in which the policies of the ruling class go unchallenged. That is, it is the subordination of the working class to the Democratic Party and its various affiliates, to which Antifa contributes, that creates the ability for fascistic groups to grow. In terms of its social basis, Antifa attracts disoriented layers particularly among the middle class on the basis of a program compatible with the aims of the Democratic Party and the ruling elite, and which is indifferent and even openly hostile to the mobilization of the working class. It is for this reason that they are being promoted in the media. A principled struggle against the threat of fascism and the Trump administration’s attacks on immigrants, democratic rights, health care, and living standards requires a fight against the entire political establishment and the capitalist system upon which it is based. It is not punch-ups with Nazis, but the independent political organization and mobilization of the working class, on a socialist program, that is the urgent task.